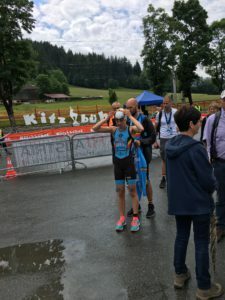 On Friday June 16th Hannelore Willen participated in the individual EK Junior Women race in Kitzbühel (Austria) together with Laura Swannet and Kiara Lenaertz. The pace of the race was set as from minute 1, with 60 athletes fighting for each meter in the Schwarzsee. 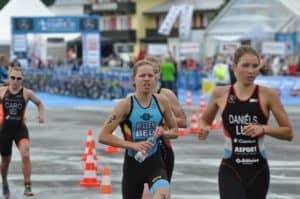 After a 750m swim Hannelore came out of the water in the second half of the athletes, after Kiara and before Laura, heading for a 20km bike race. Rainy circumstances created a very dangerous parcours, and half-way the bike race Kiara fell together with some other athletes. Hannelore stood tall, held her place in a bikers group and could pass a few competitors, starting the 5km run somewhere midst the others. Energy level was still very good, and finally Hannelore ran the 7th best running time of all athletes in the last discipline. 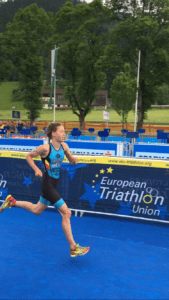 While Laura finished at place 16 in the overall ranking, Hannelore ended 25th of all athletes in 1h 02m 24s, an extra-ordinary result amongst athletes some of which are 2 to 3 years older. 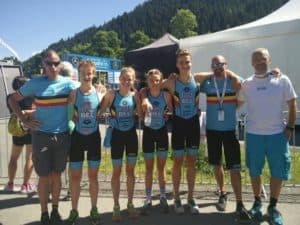 On Sunday June 18th it was time to take one for the team, Hannelore (14/C) entered the Mixed Team Relay together with Laura Swannet (14/A) and Joris Basslé (14/B) and Edouard Verstraete (14/D). Yet again an utmost thrilling race, in sprint pace this time, asking the most of each of the atletes in a 250m swim, 5km bike and 1.8km run. Aiming for a place in the first half of the ranking Team Belgium achieved their goals and finished in 8th place, absolutely well done!! A great experience, for athletes and supporters, feeding the taste for more on the international triathlon scene, definitively! !